Many warehousing businesses are seeing increased activity from suppliers and clients alike, which often requires them to hire more people. However, in markets where such companies have been hiring heavily for years, there may be a depleted workforce available to many hiring companies. As a consequence, there is now a push to start offering training opportunities for young people in particular. To that end, the logistics real estate developer Prologis, which is based in San Francisco, recently partnered with Miami-Dade County Public Schools to launch a "trade and logistics lab" that will help create training opportunities in warehousing for students in the district, according to the firm. This four-year program will onboard more than 300 students into coursework that is focused on industry needs and will provide numerous opportunities to learn more about the potential career paths they can take in the logistics field. "Creating opportunities for students to expand their skill capacity and broaden their base of knowledge is paramount to preparing them for success after graduation, and our partnership with Prologis will allow us to expand this important work," said MIami-Dade County Superintendent of Schools Alberto Carvalho. "The Prologis Trade and Logistics Lab at Miami Springs Senior High will help the school district create opportunities to provide increased academic enrichment to further elevate learning and prepare students to enter the workforce." Meanwhile, on the opposite end of the Sunshine State, the University of West Florida College of Business launched a new logistics training program in 2015, but continues to innovate and provide students with a bachelor's degree in managing supply chains, warehouses, terminals and more, according to the school. Dr. Scott Keller, professor of logistics, and director of the Center for Supply Chain Management Excellence, notes that the innovative approach the program takes has many approaches to teaching students the ropes of the logistics industry. 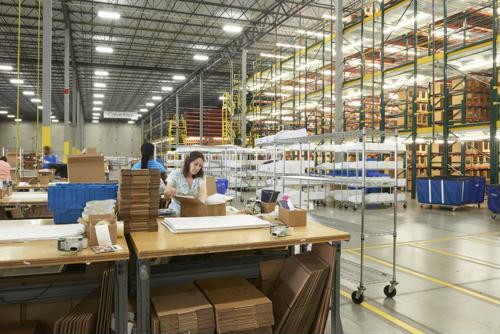 The school not only uses hands-on experience to show enrollees the ins and outs, it also has high-tech options including 3-D to help them get a better handle on warehouse management, the report said. It also has a dedicated team of industry professionals on staff to help show students exactly what they need to know. And in California, Contra Costa College recently started offering its Forklift, Logistics, Operations and Warehouse program to local job seekers - of all ages - for training in the industry as well, according to the Richmond Standard. This is a 10-week course that shows students how to operate heavy machinery and otherwise develop their job skills to make them better fits for the Golden State's burgeoning warehousing industry. When people come into the warehousing industry, they often do so with the promise of finding high-paying jobs that provide good benefits packages. When companies cannot meet those expectations, they are less likely to attract or retain talent in the long run, especially in today's low-unemployment environment. To that end, logistics firms have to continually evaluate whether their offerings are strong enough to keep them competitive.